In 2008, one of the first objectives of the newly formed Albemarle High School Alumni Association was to establish a way for alumni and friends to support current students though a scholarship program that provides direct financial assistance to deserving AHS seniors each year.. The funding of our scholarship program comes from donations by members of the Albemarle High School Alumni Association and the general public. All donations are greatly appreciated. In our second year, we added a new option that has been very popular with donors. With a donation of $500.00 or more, someone can fund a scholarship in memory or in honor of someone. This could be a family member, a classmate, a friend, a faculty member or a community leader. This could also be in the name of an organization, a company or business or your class. Once submitted, they are given the option to continue the scholarship the following year. Our long- range goal is to have an account balance worthy of investment to generate an income to fund our scholarships and enable us to increase the amount of our scholarships. Currently, scholarships are awarded in the amount of $500.00 or more. In 2014 we presented eight scholarships totaling $8,500.00, 3 fir $500.00, four for $1,000.00 and one for $3,000.00. Scholarships are awarded based on need, merit and demonstrated contribution to the Albemarle community. We work very closely with the Guidance Department at school. They distribute our Scholarship Entry Form to seniors and collect the completed forms from those wishing to enter. The Guidance Department will attach grades for the student’s years at Albemarle High School and student college write ups if available. After their review, recommendations are made and reviewed with the Alumni Association. Final selections are made and announced by the Alumni Association. Checks are written made payable to the college or university the student will be attending and presented by Alumni Association members at the school Senior Night program. See the Albemarle High School Alumni Association Scholarship Entry Form below or go to menu item Join and Support and see Scholarships. 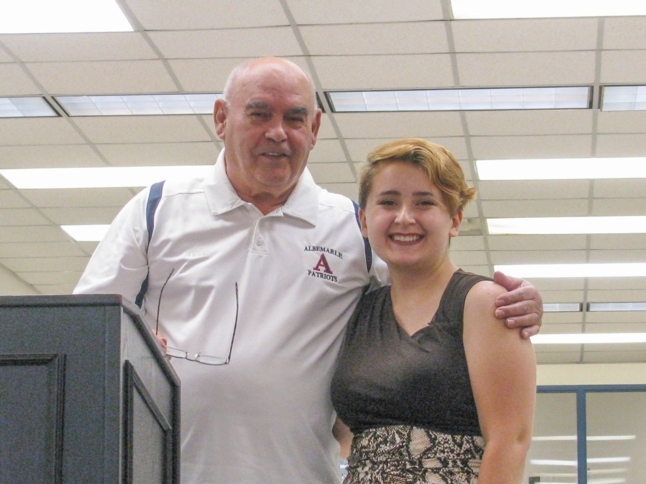 The Albemarle High School Alumni Association takes great pride in our scholarship program. We thank you for helping us help others. Our investment in helping deserving graduating seniors of Albemarle High School can have a positive impact on the individuals and our community. their designee, or the Alumni Association. Contributions to this Fund will be awarded in honor of Mr. Hurt.